The Southern strategy created an us-against-them politics with a perverse idea of morality. Trumpism was created in the crucible of the “Southern strategy.” We have sown to the wind, reaping the whirlwind. We can’t isolate Donald Trump and his supporters, because that is a simplification. When you unpack the policies of all of his competitors, most of their disagreement is in tone, not substance. It is not as though they are moderate and he is extreme. Trump is not the problem; it’s all of the xenophobia and racist innuendo and othering of immigrants that is the problem. It is all of the coded language about people who want free stuff, from the Southern-strategy lexicon of Wallace, Nixon, Reagan, and Atwater that has been spewed for years. That is the problem. Add to it the more recent rhetoric that says President Obama is unfit. Long before Trump, all of this rhetoric created a kind of us-against-them mob mentality, which after it is loosed can manifest in the violence that we now see. These were tactics used to end the first Reconstruction in America, too, when many white elites began to fear a black-white coalition. And they were used in the late 1968, to create the so-called solid South and push back against the gains of the 1960s, brought about by black, white, Latino, and interfaith relationships. We need to understand all of this as we approach this election and think about the kinds of questions we ask the candidates. Recently, Senator Ted Cruz was in Raleigh, North Carolina’s Calvary Baptist Church when FOX News anchor Megyn Kelly asked him about his moral values: “How do you manage to keep your integrity working in Washington?” Cruz said as president, he intended to “pass a simple flat tax and abolish the IRS,” “prosecute Planned Parenthood,” and end the Common Core educational standards instantly. Presidential candidates of all political stripes have long courted what the media calls the “evangelical voters” in the South, using the language of morality. Well, I am an evangelical. I have been born again. I don’t think it is because I have African and Native American and some European blood flowing in my veins that I have a different view of evangelism. Yes, I learned my evangelism from my father, a Disciples of Christ minister. But I also learned it from Duke Divinity School, from Union Theological Seminary, and from great philosophical thinkers and biblical scholars across this country. I learned that persons who claim to be evangelicals are anointed to preach good news to the poor. So as the presidential campaign comes to North Carolina on Tuesday, we in the Forward Together Moral Movement and the North Carolina NAACP urge the media not to take a positive or negative stance toward specific candidates, but to ask deep moral questions of all of them. We encourage media and voters to ask about public morality—determined by policy choices and budget choices, by concerns like Medicaid expansion, voting rights, and poverty. Ask them how they “manage to keep their integrity” when 500,000 low-income North Carolinians—including roughly 30,000 veterans—have no health insurance because Governor Pat McCrory and the legislature have chosen not to expand Medicaid. Medical authorities at UNC Hospitals estimate that as a result of this immoral choice, each year 2,500 North Carolinians will die unnecessarily due to lack of healthcare. Most will die because a lack of preventive care leads to needless strokes and heart attacks. Ask them why they place their political ideology over human needs. Ask state legislators how they manage to keep their integrity when they passed a voter suppression bill the afternoon after the US Supreme Court gutted the Voting Rights Act in the morning. Their voter suppression law made dozens of changes to voting policies, aiming to hold down turnout. Ask candidates what they are doing to expand voting, not restrict access to the ballot. Ask them what they will do to raise real wages, which have dropped steadily since the 1970s, leading to the greatest economic inequality in America since the Great Depression? Ask them if they support the fundamental principle of all great religions and ethical systems in the world: To love one’s neighbor. Ask them whether they can name three or four policies that they believe would be the logical outgrowth of a social ethos grounded in love for one’s neighbor. How would they act to bring those policies about? And in that context, what would a moral, comprehensive immigration policy look like? Few moral issues are more pressing than public education. We might ask candidates if they support the use of public money to pay for private schools, including voucher or tax credit programs. Do candidates support the unlimited replacement of traditional public schools with charter schools, and how do they see the impact of charter schools on public education? What are some ways that candidates would support public school teachers? Most citizens increasingly support equality and justice for all citizens, including those of different sexual or gender orientations. One moral question for candidates is how they would safeguard the rights of LGBTQ citizens to be free of discrimination or attack because of their sexual or gender orientation. 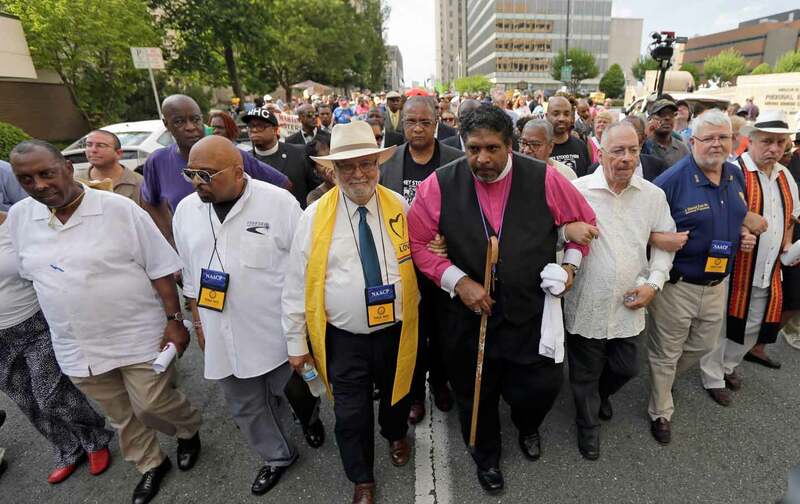 These are a few of the moral questions the Forward Together Moral Movement and the North Carolina NAACP believe the media should be asking candidates today. If we are to “prosecute Planned Parenthood,” what will we prosecute them for? Would we prosecute those who slandered Planned Parenthood with doctored film footage? What kind of educational standards would best serve our children and nurture them for the world in which they are growing up? It is time that we asked serious moral questions of all of our candidates. Rev. Dr. William J. Barber IIThe Rev. Dr. William J. Barber II is national president and senior lecturer of Repairers of the Breach. His latest book is The Third Reconstruction: How A Moral Movement is Overcoming the Politics of Division and Fear.